“The right tool for the job.” It’s a saying that my father used quite a bit. It’s a saying, “the right tool for the job,” that’s so popular it’s been co-opted by other, non-trade industries, but I never fully appreciated it until recently. From experience, I’ve learned it basically means “If you have the correct tool for the job, you probably won’t ruin things, and you’ll curse much less.” For my decades of putting tools to the test, it all comes down to one thing… can I use it as a hammer? Of course, by that I mean, “Which tool will be the highest quality, most durable and the best bang for my buck?” But also, I’m probably going to use it as a hammer eventually, either because of frustration, rage or pure necessity. 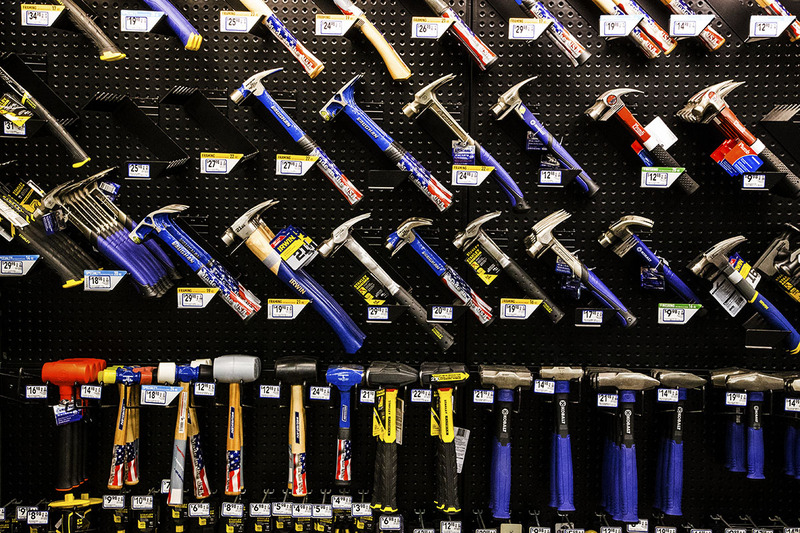 There are so many places to find yourself the perfect pipe wrench, drill press, or miter saw for whatever job you’re tackling, that it’s mind-boggling to think about. I’ve narrowed it down to 3 categories to help you decide not what tool is best, but what tool is best for you. Congratulations, you just bought a house! You’ll need tools for up-keep, and repairs. Just go Craftsman, hit up Sears, or find a nice K-mart special-30 piece tool set. That’s all you really need. No need to spend a Corvette’s worth in tools for light-bulb fixtures and table leg repairs. Done. You’re a serious DIYer. You need a quality tool for the job but you don’t need the best tool on the market. I’ve worked on my car since I purchased it at 14 using whatever tools my dad had. They usually weren’t the best quality, but I still use some of them to this day. Go Craftsman for hand tools or better. Their wrenches, pliers and hammers are perfect for everyone from the weekend track racer to the most Ron Swanson of us all. The higher initial price is out-weighed by the lifetime use of the tool. Just check for the warranty so you can replace it if necessary. If you make a living off your tools, you’re going to want something that will pay for itself over the years. You need power, precision, and durability. 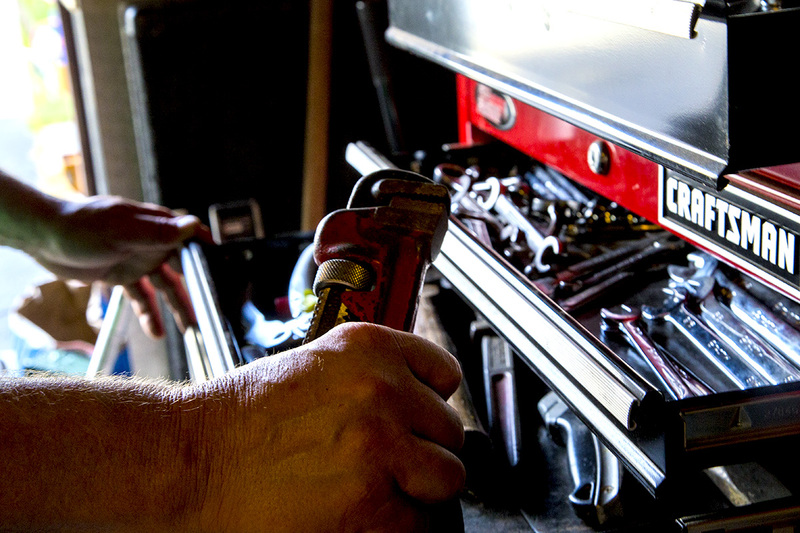 The hands down consensus is that if you want the best tool that’ll last a lifetime, you want Snap-on. If your company is paying, or if you can afford it, Snap-on is the best bang for your buck for any dedicated, daily wrench jockey. They have consistently beat any challenger for best in the business. If that isn’t a possibility, brands like SK, GearWrench, Matco Tools and Mac Tools offer replacements with warranties that are just as good with only a minor sacrifice in strength and durability. Adapting to advances in technology can sometimes be a drag. Learning new software, purchasing new tools, updating procedures due to regulation; sometimes it’s a hassle. For contractors though, there are some products and advancements simply too good to ignore, and one of those today is helical screw pile systems. Although screw pile systems have been around since the 1800’s, installation methods have become much easier. Advancements now allow for helical screw piles to be used for a variety of applications, both large and small. To be brief, helical piles are steel shafts with helix shaped bearing plates. They are generally used for deep earth foundation applications, providing structural support as either piers or as tension anchors. There are numerous types of plates, shapes, sizes and designs available, each made for specific applications depending on the integrity of the soil and the weight or tension the helical pile is meant to support. One popular use for helical piles is as piers under porches, decks or small additions. Traditionally, holes are dug by hand or with excavators and concrete is mixed and poured into a tube. Afterwards there is still a cleanup involved, not to mention the curing and drying process of the concrete. This all equals a lot of man hours, perhaps a couple days, especially if there are 10+ piers to install. Now imagine finishing all this by lunch and construction above beginning immediately. With no waiting for concrete to dry or inspectors to ensure your holes are a minimum of 4’ deep, helical piles are an incredible time saver. Not to mention less labor intensive. Your back muscles will thank you, or at least your crews will. Helical screw pile post installed under a porch. In addition to saving contractors time, the steel shaft pier will also be a blessing for the property owner. Take a look at some concrete piers and you will notice some have heaved, many have settled and others are simply crumbling away. 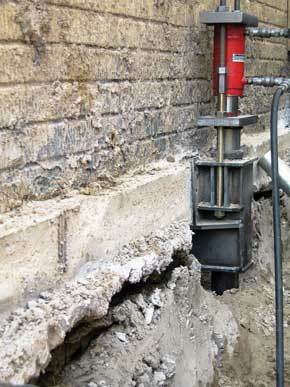 These are now problems of the past, as helical piles are installed at depths based on soil conditions. When installed correctly, there is little chance the shafts will ever settle or heave. This means one less repair to consider in the future. Another plus; helical piles can be installed year-round whether there is frost or soggy, wet soil. Again, crews will be grateful. Contractors also use helical screw pile systems for docks and walkways in marinas, on lake shores, or for bridges in parks and golf courses. Green thumbs will love it too, as little or no earth is displaced and there is minimal impact on the environment. As mentioned, there are several applications for helical screw pile systems, the pier/post being just one of them. 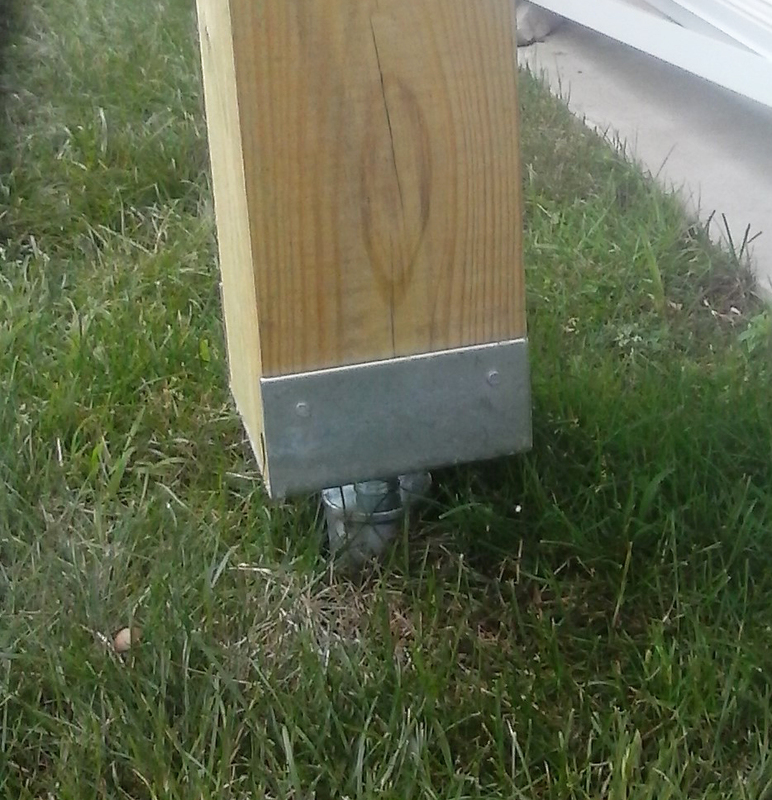 More heavy duty push piers (not always with a helical plate affixed to them) can be used for stabilizing, or even raising, settled buildings. 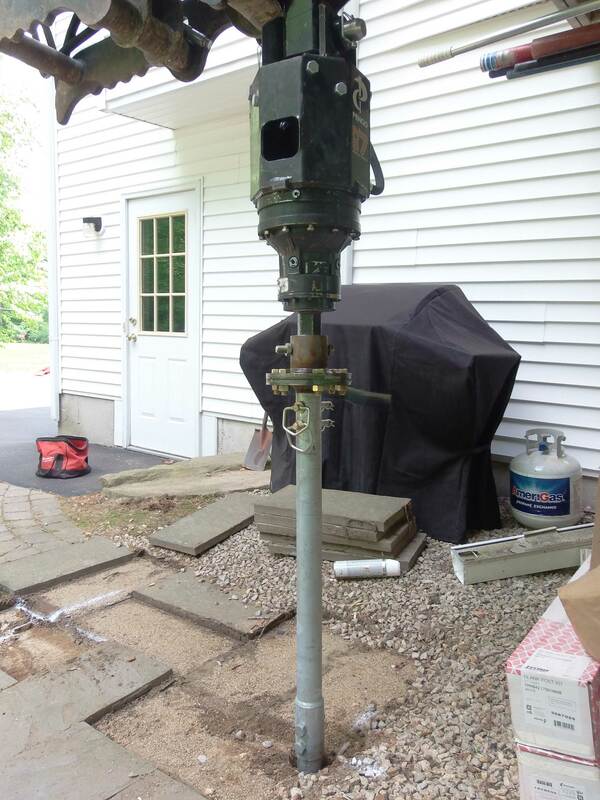 Push piers save property owners from having to completely replace failing foundations due to settling. Likewise, for new construction, helical piers can be installed under slabs or footings to ensure homes or buildings will never settle. This can be especially important in places known for having problematic soils, such as in areas over old landfills or near high water tables. It’s worth noting special equipment is needed to install helical screw pile systems. Bobcat’s or Kubota’s of various sizes can be used, fixed with unique driver heads available for purchase from the manufacturer of the steel shafts. 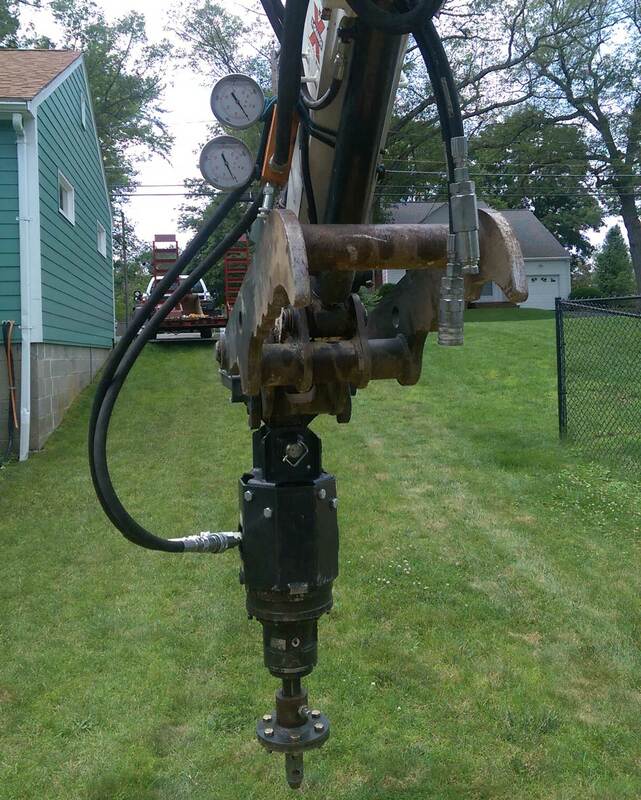 For contractors to get outfitted for installing piers with a machine, trailer and fixture, starting costs will range from $35,000 – $50,000. When choosing a machine, keep in mind how much force may be needed to drive in the screw piles, and also maneuverability on job sites. Depending on how many piers a contractor installs, they can expect to gain the monetary benefits of their investment within a year or two. As mentioned though, the benefits of saving time will be felt immediately. For the push pier systems, a maneuverable hydraulic pump set up is used for applications. No real heavy machinery is required, and sometimes installations will take place from within the basement rather than from the exterior. Though not required, engineers will sometimes be involved with these systems, which will effect overall costs for property owners. However, when it comes to saving an investment such as a home or property, it is almost always worth the costs. So for contractors who may be weary of trying new things in the field, just know that while you’re mixing your 16th bag of concrete, another contractor using helical piles has already begun installing their floor joists. Sometimes, change is good. A quick internet search for “industrial supplies” will yield over 1.7 million hits, while searching for “machine shop supplies” displays some 105,000 results. What’s a machinist looking for machine tool suppliers to do? Like looking for a descent restaurant, finding a good machine tool supplier can be hit or miss without some help. Word of mouth can go a long way and experienced shop owners and purchasing agents can offer a wealth of information. There are also online message boards filled with fellow chip-makers and their favorite supply houses. Let’s start with two connected companies. MSC Industrial Supply and Enco used to compete directly with each other for much of the same machine tool supply business, leading the larger MSC to buy out Enco. Although Enco is now a subsidiary, they print their own catalog and have very distinct business practices compared to MSC. Both houses stock a great assortment of common machine shop necessities, including cutting tools, raw materials, abrasives, measuring tools, etc. Both companies, in my opinion, have great customer service. The staff is friendly, knowledgeable, and genuinely appear to appreciate a customer’s business. Both MSC and Enco take orders over the telephone or via the internet and accept credit cards with no minimum purchase amount, and both are mail order only (no walk-ins). There are a couple of differences between the two companies, though, that set them far apart. The question to ask yourself when choosing between the two is, “how quick do I need my order delivered”? If you place your order with MSC during normal business hours, you will receive it the next business day while paying only UPS Ground Rates, regardless of how they have to ship it to you for the next day arrival. When you break your last odd-sized drill or tap and have a looming delivery date which you’d prefer not to be late on, this service is boss and can save a lot of headaches. You’ll pay more due to higher catalog prices, but it’s there when you need it. MSC also offers a considerably larger selection than Enco on just about all categories of goods. Looking at cutting tools as an example, MSC lists over 40 brands of end mills ranging from import (Chinese) goods all the way up to top of the class manufacturers like OSG, Dormer, and Union Butterfield. In between these two extremes are MSC-owned toolmakers including Hertel. MSC has the reputation, as well as the vast inventory, to be considered both a machine shop supply house as well as an MRO (Maintenance, Repair and Operations) supplier. Enco, on the other hand, is all about pricing. They have a low price guarantee that I’ve found to be real. [Enco] will verify the competitor’s price and offer it to you at the lower price plus an additional 5% discount. For example, if you are purchasing a length of brass round rod and find a lower price at “XYZ Industrial Supply”, just give Enco a call with the specifics, and from there they will verify the competitor’s price and offer it to you at the lower price plus an additional 5% discount. Enco also offers free shipping codes on a regular basis. To qualify for free shipping, you must meet minimum requirements which usually range from $25 to $49. You have to order ahead, though. 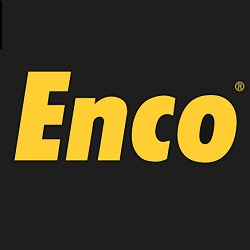 Enco ships UPS Ground and your order may take a few days to arrive. While we’re discussing Enco, lets revisit our search for end mills. Enco offers just three basic choices: Interstate brand (Chinese), Hertel brand (company-owned, US made) and OSG (US and Japan made top shelf). While Enco does stock limited MRO goods, it is mainly a machine shop supplier. Of course, these aren’t the only two machine tool suppliers in the machine shop industry. Up next, we’ll cover McMaster-Carr and Grainger Industrial Supply. Like MSC and Enco, they have their own strengths paramount to themselves, and are like tools themselves that one should keep in their manufacturing pocket. Stay tuned for more! If you are a professional welder, you know that you have many different choices when it comes to your equipment. There are a plethora of brands for a variety of areas of the trade. From Tweco welding guns to Black Stallion gloves, the choices are seemingly limitless. While welding torches and gloves are important, arguably the most important piece of equipment is the welding power source. For serious welders in the United States, there are really only two brands to talk about. The first of these, but not necessarily foremost, is Miller Electric Manufacturing Company based out of Appleton, Wisconsin. Now owned by Illinois Tool Works, Miller has been making welding equipment for over three quarters of a century now. They have a variety of solutions for your welding needs. They have gas metal arc welding (GMAW) and gas tungsten arc welding (GTAW) solutions for the hobbyist, such as the Millermatic and the Diversion. They also have solutions for heavy manufacturing such as the Syncrowave and the Continuum. For the construction industry the have the XMT. They also developed the Auto-Axcess for robotic applications. Miller Electric has been making welding power sources for a long time now, and their quality products under the operation of a skilled welder will most definitely produce satisfactory results. For those welders who aren’t so fond of the color blue, there is another manufacturer to meet your needs: The Lincoln Electric Company. Lincoln Electric began before the twentieth century, but they didn’t start creating welding machines until around the time the Model T was released. The rest is history. From then on out they have made and continue to make some of the most popular welding power sources in the world. 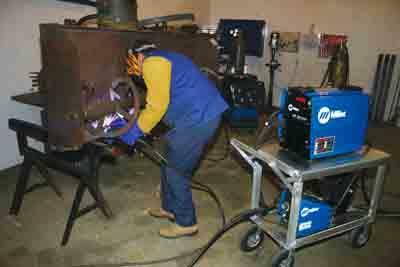 They, like Miller Electric, offer a wide range of welding power sources to meet industry needs. Power MIGs and Invertecs for the garage welder. Power Waves for large manufacturing operations. Flextecs for when a variety of welding processes are needed out of one power source. 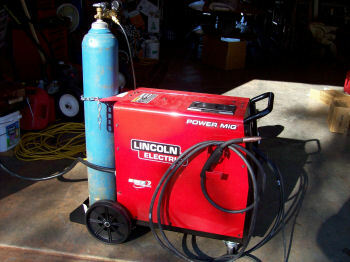 If you need to weld it, chances are Lincoln Electric power sources can help you get it done. Truthfully, I have barely scratched the surface of the equipment offerings these Miller Electric and Lincoln Electric offer. Visiting their websites or talking to a sales representative at your local welding supply store is the best way to determine how your welding equipment needs can be satisfied by these two companies. As previously mentioned, there are many different welding equipment manufacturers out there, but if you go with a Lincoln or a Miller, you can bet you will get your money’s worth. Ever wonder how to build skills for railroad jobs? We are looking for blue collar men and women to contribute reviews, opinions, stories, tips & tricks, and news pieces to the only blog created by and for blue collar workers.